We’re in the cake home stretch, people! Woohoo! I mean. Look at that. How could this go wrong? 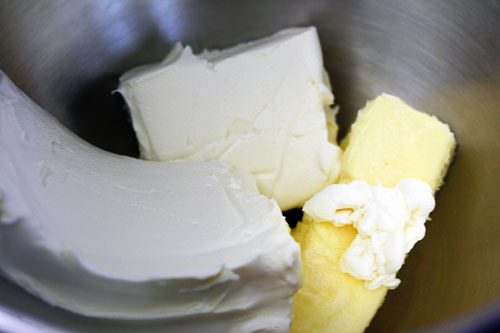 It’s even full-fat on both the cream cheese and the butter. 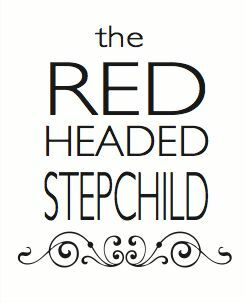 Because it’s a special occasion and we’re worth it! And because we have to stay married to each other now even if we get fat. So, you know, might as well. 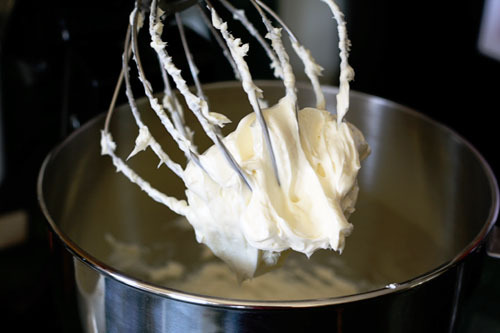 The butter and cream cheese get mixed with two teaspoons vanilla and two cups of sifted powdered sugar (AGAIN WITH THE SIFTING). 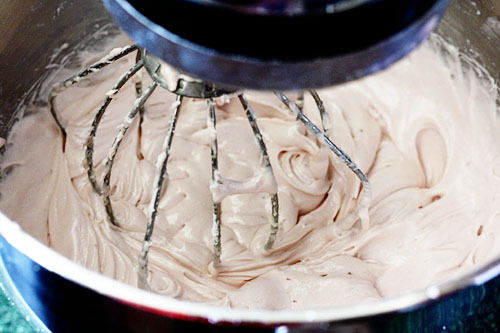 Then blended, blended, blended into utter deliciousness. Oh but wait! Don’t forget to add the puree! I added all that was left, just a quarter-cup. I’m happy that Mr. P did not feel emasculated by having a pink cake, because this was so crazy good. 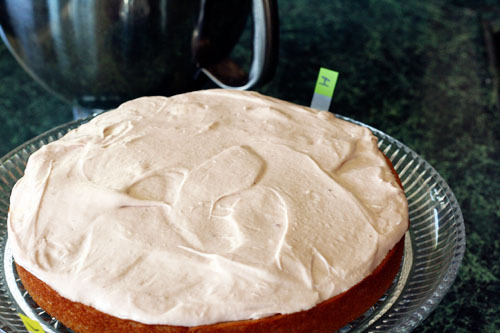 The icing is super buttery and rich, not very sweet – I kept the amount of sugar low thanks to trying my friend’s not-so-sweet icing and loving it. Once made, it’s time to fill the layers and ice the cake! I actually have an honest-to-goodness cake-frosting tool that was my grandmother’s, but I found it easier to just use a butter knife instead. 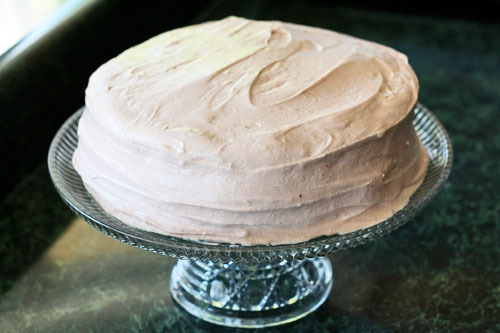 This recipe makes PLENTY of icing, so don’t feel like you have to skimp on the icing filling between the layers. I should have added a bit more there because the icing on the outside was quite thick. Now finally, FINALLY: time to decorate this ridiculously complex cake! 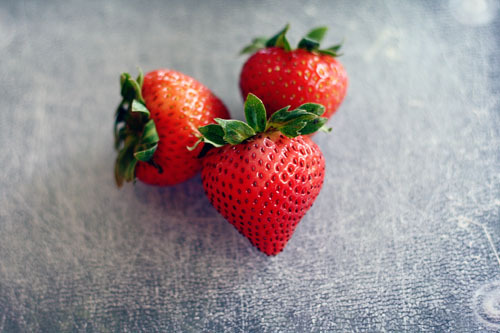 Remember how I saved a few strawberries before making the puree? Well, I pulled those out and sliced them lengthwise into very, very thin slices. Which happened to be heart-shaped. SHUDDUP IT WAS OUR ANNIVERSARY OKAY? I get to be romantic sometimes. And because at this point I refused to have wonky decorations on the most complicated cake I have ever made, I arranged them on a plate first to make sure I liked the design. After excitedly nodding approval to myself (I’m not the only one who does that, right? 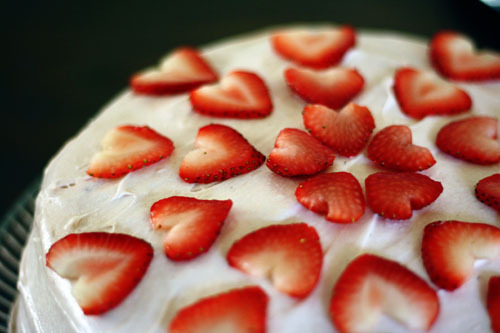 ), I transferred the heart-strawberries to the cake. And voila! I may have run around the apartment carrying the cake to show it to Mr. P in the other room, full of PURE JOY that it all came together without any major disasters! But of course, at this point, it needed to be an incredibly delicious cake to make up for the effort involved. And fortunately, it delivered. It was so moist and flavorful, and because it was so rich, it lasted a super long time between the two of us AND our company. We kept it in the fridge for a week, and although it was starting to get a bit dry by the end, it was still delicious. And it still looked like it belonged on Valentine’s day, not a hot summer day in June. Oh well. So that’s my incredibly long-winded tale of the incredibly long-process cake! I hope that the time involved doesn’t scare you off from trying to make this, though. If you, like me, are not a particularly clever or quick baker, you might need to save it for a special occasion, because it’s not like I whipped this up in an hour. But it does make that special occasion extra special! The only downside? I want more cake now. LOVE the heart shaped strawberries!! WE ALL want cake NOW, too! So! I know a certain somebody with a birthday at the end of this month. 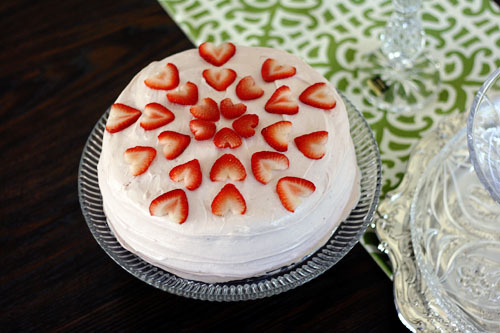 You're really tempting me with the idea of making this cake! If the puree isn't really a puree, but rather just juice, could i save myself the time and just run the strawberries through a juicer?! After they've sat an hour in the sugar? 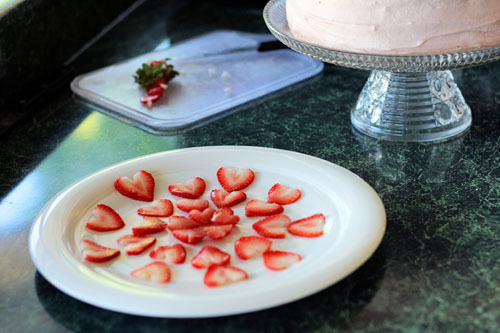 If you read the original Confections of a Foodie Bride source (linked in the cake post), she says you can either strain the strawberries or run them through a food processor. The second source (Elly Says Opa) says straining and boiling it down concentrates the flavor a lot more. So maybe you could use a juicer and then boil the resulting juice down to 3/4 cup with the bit of sugar? Let us know how it goes!